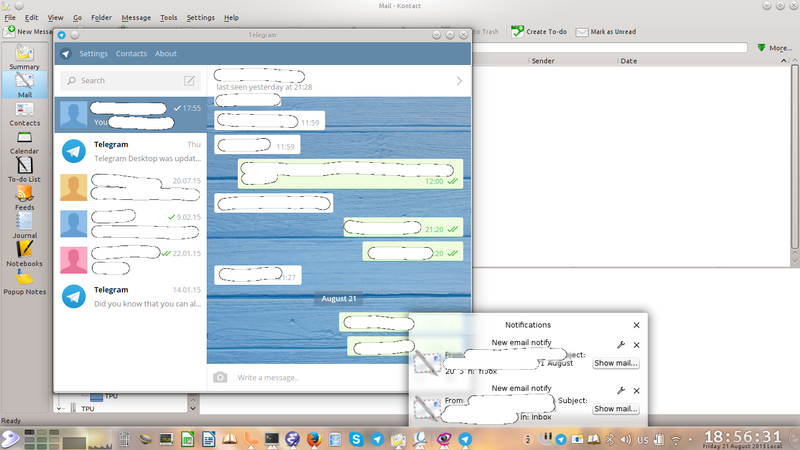 I actually don't know if this is Telegram or KDE bug, but when Telegram is launched and minimized to tray and a new e-mail arrives triggering a "New mail notification" and you push "Show mail" button -> Telegram desktop app is maximized. The same is when you get a download finished in FireFox and receive a notification with a button "Open" (to open a folder with the downloaded file). Push the button and for some reason Telegram app is maximized. Telegram app is simply downloaded from its web-site. Its version is 0.8.52 now. 1. configure KDE notifications so that they have some buttons to push, e.g. "Show mail" for KMail. 2. Start Telegram and minimize it to tray. 4. Push a button in it. Expected result: Show a KMail with new message. Actual result: Telegram is maximized and focused. The new message is opened in a background. I attach a screenshot with an example of the notifications and buttons. And I have started an "Issue" in Telegram git-hub repo.